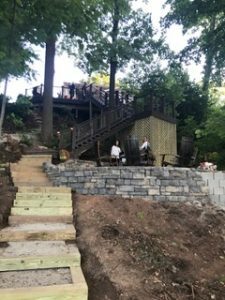 For this week’s #FeaturedJobFriday, we are looking at a job done by ABT Foundation Solutions. 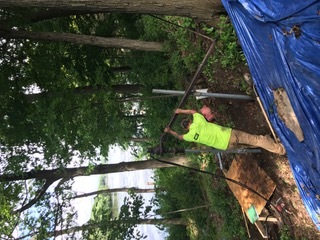 They had a customer who was looking to install piers for a large multi-level deck overlooking the Fox River! 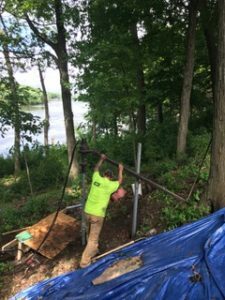 They installed 19 Helical piers (8″ single helix) 2-7/8″ with pre-construction caps and used 542′ of steel. 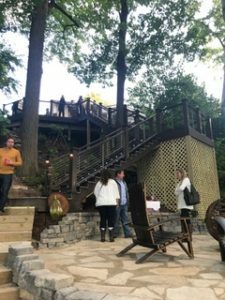 Many contractors would not bid the traditional sonic tubes for the homeowner so they reached out to ABT Foundation Solutions. 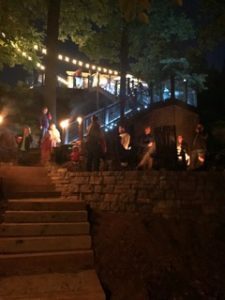 The slope and work conditions made this project unforgettable! 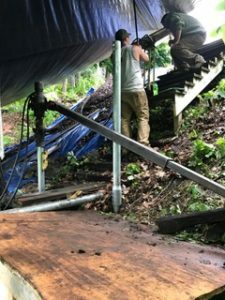 The difficulty lied in the ability to get equipment up and down the extreme slope. 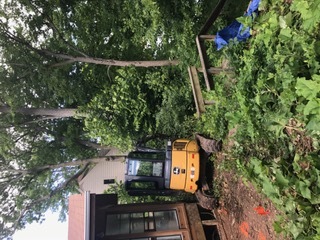 ABT Foundation Solutions had to get their equipment from the top of the land, where the house was, to the bottom of the hill. 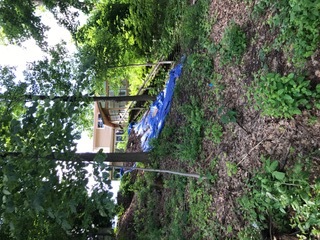 It also rained during the middle of the project, which caused its own problems. 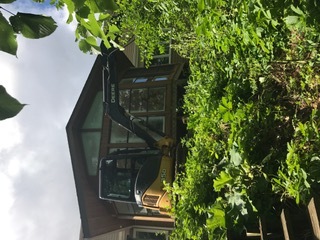 These conditions made the project difficult and even dangerous since there is more than a 50′ drop from house to river! 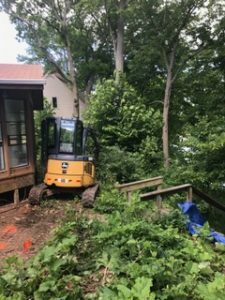 ABT Foundation Solutions used a mini excavator to overcome these issues. 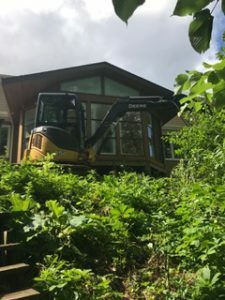 The excavator was tied back to the home with a chain to drive 9 of the piers. 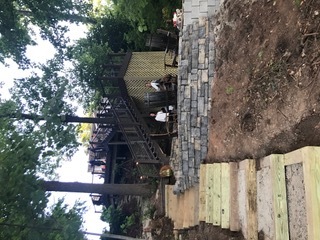 The rest of the piers they had to do by hand. 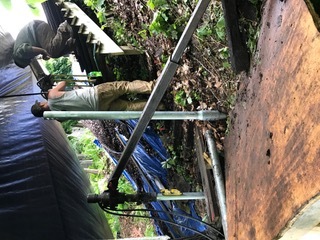 ABT Foundation Solutions built make shift platforms to give their installers a more suitable, level surface to work on. 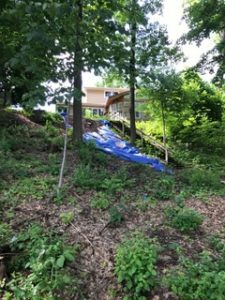 In order to combat the rain, ABT Foundation Solutions used a tarp that they tied off at the house and down the tree line in order to keep the project moving forward. 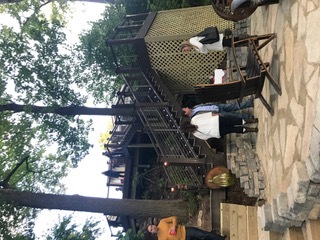 ABT Foundation Solutions and their installer team, which included Dallas Brehmer, David Brehmer, Brian Lemmers, and Brian Blank, did a great job!